translation of the Holy Quran . of Kuwait. He leads the Taraweeh Salaat, every year, in Ramadan. recitations can also be also found on MukminTV or YouTube. I am looking for his voice for a long time....Alhamdulillah I find him.....May Allah bless him. Alhamdulillah. You are given a wonderful voice, you are given what Allah SWT has given to you. May Allah SWT serve a great purpose through your voice to our reawakening ummah. Ameen. What a possessing voice!!! Masha-Allah he has really amazed me. Sweet melodious voice plz also listen the recitation of Mr.Zaki Dagistani I'm sure you will be amazed by his style . Jazak Allah Khairan. MASHALLAH HE HAS EXCELLENT VOICE AND HIS WAY OF RECITAION IS VERY DIFFERENT FROM OTHERS. MAY ALLAH PROSPER IN BOTH WORLD HERE AND AFTER. Maa Sha Allah, Subhaan Allah, ALLAH Subhan Wataala Has gifted a very very special intonation to my brother Mishary Al Afasy. I pray that may ALLAH bestow more n more "Malekah" to my dearest muslim brother Mishary Bin Rashid Al-Afasy. AS salam o alaykum . i read in other website that misharay rahseed fasy is Kuwaiti national and he is the imam of mosque masjid al kabir .he lead his tarawe prayer in this masjid . he is certified number of islamic scholar . these scholar is certified his quran reading . Mashallah, Alhamdulillah, What a voice, when I am browsing I came to hear Misharay Rahseed Alfasy, nasheed Rahman, Ya Rahman and I just absorb in it and hearing it continuously many times, loved the way he recite the Nasheed. His voice is so beautiful that every one will be fond of him..As his voice his face is also very beautiful Alhamdulillah. Then I heard his Quran Recitation and my love towards his recitation is increasing day by day. We all praise You Brother . Thanks for giving us the Quran in your beautiful vocie. Assalam-o-Alaikum Wa RahmatAllah-e-Wa Barakaatu. 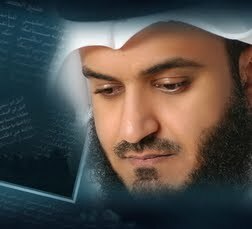 Sheikh Mishary Rashid Alafasy is an asset for this generation and generations to come. His beautiful tilawat-e-Quran is heart warming and creates spiritual awakening. JazakAllah! Allah Bess him in this world and hereafter. Hello everyone am sorry to invade...I am a christian but I love hearing the voice of this man. I love listening to his songs. indeed may Allah bless him more! JAJA KUMULLAH, VERY SWEET QURANE TELWAT.